Please note: Early check-ins that require keys before 4:00 PM may be charged $25.00 plus a 17.20% tax and is based upon availability. The hotel parking lot is $18/day for self-service use. Upon check in, you will be issued a parking pass for your car as well as a parking card to enter & exit the lot. The hotel is compliant with ADA policies, and offers ADA compliant guest rooms, most with roll-in showers. For guests requiring wheelchair or motorscooter rentals, please contact our hotel Concierge at 714-778-1700 ext. 3803. Personal checks are not accepted unless the check is received a minimum of 14 days prior to arrival. Check cashing services are not available. A credit card authorization deposit of $100 is required for all reservations at check in for incidental charges. Additional authorization will be required once incidental charging begins. Please note: if paying with a debit card, funds will be held from your account and applied to any incidental that may be incurred. If there are no charges, this hold amount will be released back to guest account, but can take up to 14 days to process. 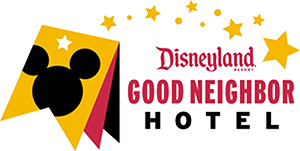 Anaheim Majestic Garden Hotel is not responsible for any returned checks or bank fees due to credit holds. The hotel offers several pairs of connecting rooms. Most of these pairs have two queen-size beds in each room; a few have one king bed in one room and two queen beds in the other. The hotel will make every effort to honor a request for connecting rooms, but they cannot be guaranteed before check-in. Valid identification must be presented for all credit card transactions. Credit card must have chip technology to be used at the Hotel. Please be advised that a fee of one night’s room rate plus taxes may apply to early departures. Arrivals prior to check-in time cannot be guaranteed, but will be honored based upon availability. Any arrivals prior to 9am will be subject to another night fee. A rollaway bed is available for an additional fee of 18 USD plus tax per night. To purchase or redeem a gift certificate, please contact the hotel directly. For security purposes, valid photo identification is required at check-in. Acceptable forms include a passport and a U.S. government-issued ID. The hotel does not have storage space for refrigerated items, crates, pallets or large shipments. Any materials that arrive to the hotel may arrive no earlier than Two (2) days prior to the guests arrival or start of the program date. The above handling and storage fees will be assessed. The hotel does not accept any liability for equipment, goods, displays, or other materials, which fail to arrive at the hotel. The hotel will not be liable for loss or damage. The hotel is unable to ship to international addresses. When traveling with a pet and/or service animal, it is imperative that the hotel be notified in advance of arrival. Cats and dogs permitted in specific and designated two queen bed traditional rooms only. These are limited in number. If traveling with a pet please contact the hotel in advance to arrange for a pet room assignment. A nonrefundable deposit of 50 USD plus tax will apply per stay. The pet must be accompanied by an owner at all times—on a leash or in a crate—and may not be left in a room unattended without an owner present. A waiver must be signed at check-in and guests will be responsible for repairs of excess damage or if deep cleaning is required. If damage is discovered after checkout, the credit card on record will be charged. Service animals that provide assistance to individuals with disabilities are welcome at the hotel. The pet fee is waived for service animals. Leashed pets are permitted on the hotel’s Disneyland Shuttle. Dog kennels are available at Disneyland for a fee. Veterinarian paperwork is required. All guest rooms and most public areas are 100% smoke-free. Smoking is permitted on the Bistro patio, rose garden, pond courtyard and a designated area in front of the hotel. A $200 cleaning fee will be charged to any guest who violates the policy by smoking in any guest room.